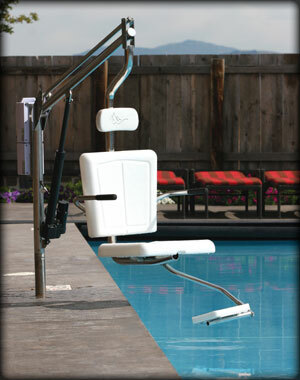 The i-Lift battery powered Americans with Disabilities Act (ADA) compliant pool lift is the most economical & efficient solution to ADA compliance. Designed for in deck installation of in-ground pools/spas for all commercial and public pools, from large scale aquatic facilities including schools & university’s, to fitness and recreational sports clubs, hotels/motels and more. The i-Lift can be Made Portable With the i-Lift Mate. Compliance is required by March 15, 2012 but don’t wait, the i-Lift is by far your most economical and versatile solution. The i-Lift battery powered lift has a safe and easy operating system which is rotationally and vertically powered. Accommodates a setback of 6″ to 22″.